Hi, I have imported a dxf into T2 and it looks good on the screen, but going into laser control it gives a total distance of 2.6 Mtr and a time of 2 mins 36, @500mm / min rather than approx 400mm as a cutting line. Seems I can't upload the original file to the forum, but let me know how I can do that and I'll upload. This is a single curve cut across a 250mm wide piece of material. @DavidF You can send me the file by email or post a screen shot here. I'm not really following you, are you saying the size is wrong? The total distance includes laser head moves to get to the start and between any points and then back to the origin afterwards. Hi Zaxs, I have a dxf that should have a cut length of less than 400mm and take a minute or so to cut at 500mm/min. In the laser control page it is saying the the total laser travel is 2.6m(Metres??) and should take 2 mins 36 sec. The start point is set to lower right and that would be the point I start the cut, so is there any other slow travel involved? The reason it was obvious is that this is likely to be a 4 pass cut and the time seemed very slow at 10 mins. If I press S to simulate there doesn't seem to be any unnecessary movement. @DavidF Well there's no way that line can be 400mm, it's showing 723.6 for the X axis and it's not a straight line so logic tells me it's got to be >1000 but I'm not sure how it's 2600 unless it's also in negative space or it's 2 passes over the same path? If you email me the DXF (or if you can post here, not sure) I can load it and see what's going on. Hi Zaxs, Got it sussed.. It seems to be a scaling error coming out of inkscape. The original dxf was 250 wide, with the curve it would be around 400mm. 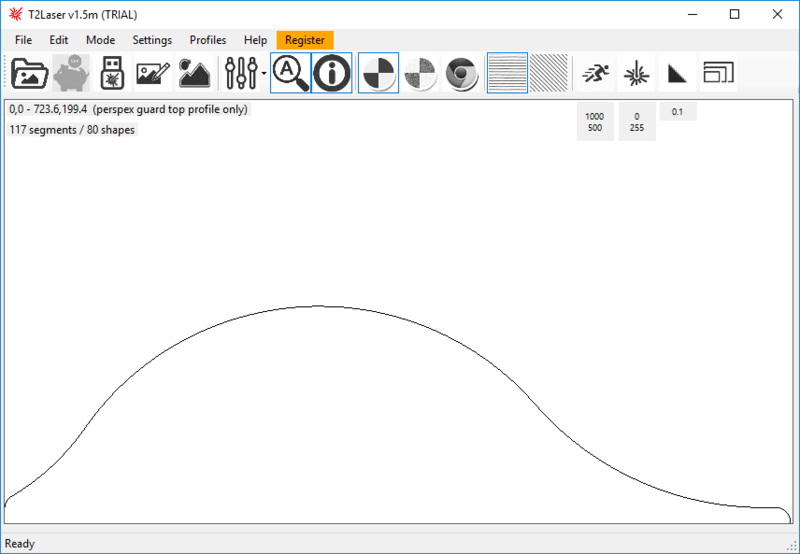 However, I had to modify the dxf in inkscape to remove three straight lines that closed the original profile. @DavidF If you need it there's a quick guide on my website showing how to export accurate DXF files from Inkscape. 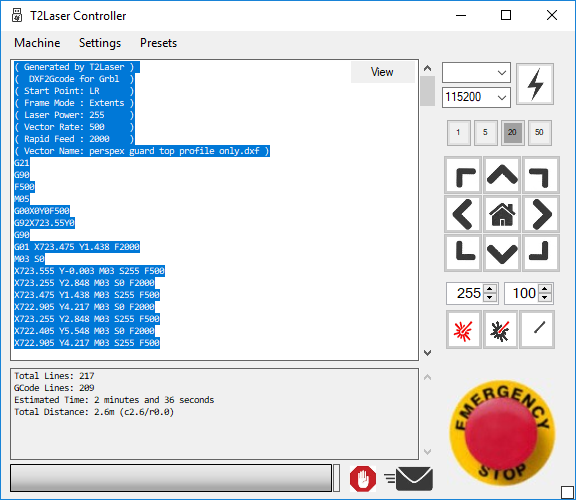 If you want to test something regarding the stop hang-up issue, try enabling "Simple Streaming" in the Settings / Advanced menu (on the laser control screen). I wouldn't leave it enabled but for a test it would be good to see if that helps, if it does then the problem is your Nano that runs the laser. Thanks Zaxs, I'll try that. Just followed your directions from the web site and if I follow exactly and set initial parameters to mm, and then the "save as" parameters to px, the size in T2 comes out as 900+. Only if I set all to mm does it come in correctly. Possibly because I am starting with DXF in Inkscape and simply editing it? 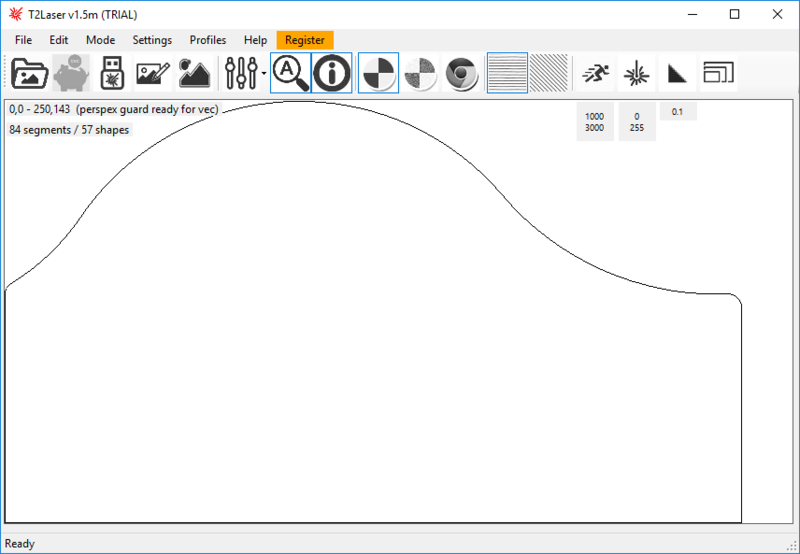 @DavidF The DXF export in Inkscape isn’t perfect but you can usually get it to work. It sounds like you have a procedure that’s working so should be OK.